Recycled paper has long had a reputation for being dingy, dull and low-quality. However, with recent advancements in technology, these stigmas no longer hold true. 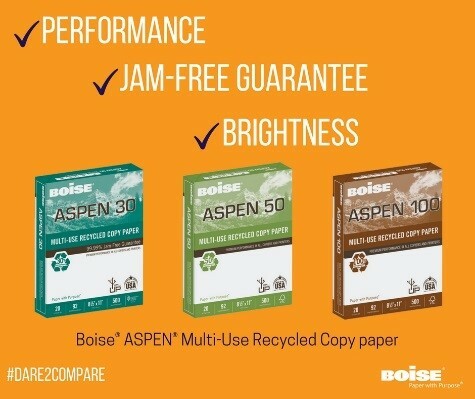 Recently, Boise Paper asked us to help build awareness for the quality and performance of today’s recycled paper with a four month-long comparison campaign. 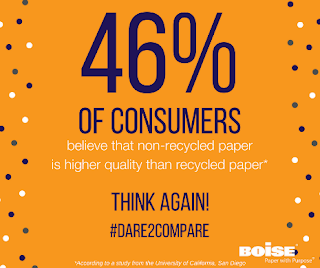 The #Dare2Compare campaign showed the similarities between Boise® X-9® Multi-Use Copy paper and Boise® ASPEN® Multi-Use Recycled Copy paper – proving that recycled paper performs just as well as the non-recycled line of paper. We kicked off the campaign in April with a video contest that allowed us to collect user-generated content for use throughout the campaign. To enter the contest, participants were asked to create a video telling us why they choose to use recycled paper. Entrants had the chance to win prizes and have their content featured in future Boise Paper marketing materials. We also worked with online office experts to compare Boise Paper’s recycled and non-recycled copy paper to prove that there’s no difference in quality. Then, we used quotes from all of our advocates to raise awareness and change perception with a sponsored post campaign on LinkedIn. Other social content utilized statistics about paper buying preferences and perceptions, and challenged social media followers to take the #Dare2Compare challenge by testing the two papers side by side. We also supplemented our organic activities by reaching out to small business decision-makers directly. We developed two direct e-mails to tell our story, and also used search/display ads to drive the purchases of Boise ASPEN. In all, the multifaceted campaign generated more than 81.6 million impressions and successfully helped to educate our audience that recycled paper has the same high-quality as non-recycled paper.